Company Profile ~ Rippon Boswell & Co. 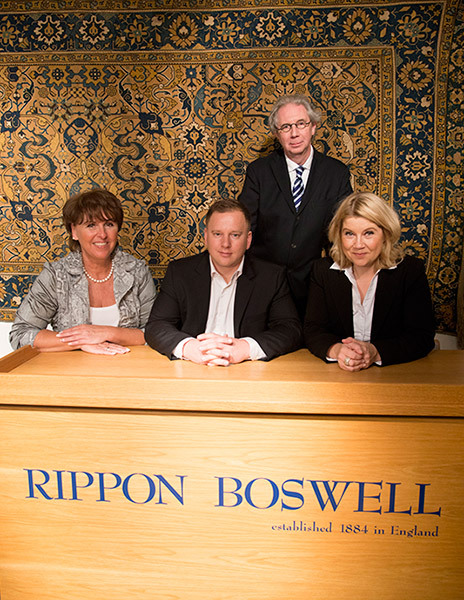 Established in England in 1884, RIPPON BOSWELL is an auctioneer specialising in antique rugs and textiles. The eponymous companies in the UK, Switzerland and Germany all evolved from a single business founded by John Rippon in Exeter, southern England, in 1884. An "Estate Agent & Auctioneer", he specialised in sales and auctions of property, bequests and homes complete with their furnishings. John Rippon was succeeded by his son Henry, who went into partnership with George Boswell in 1904. The company has been trading under the name of “RIPPON BOSWELL” ever since. Following George Boswell’s death, the company passed to L.D. Phillipps. In 1969 it was taken over by an international consortium. The new owners chose to specialise in carpets and to relocate the company headquarters to London, at the time an important centre for the antique carpet trade. The syndicate also decided to establish foreign subsidiaries in order to improve its position in the international auction market, which was experiencing a period of change and economic growth. The Swiss branch in Basel opened in 1974, and the German branch of Rippon Boswell in Frankfurt am Main held its first auction in 1976. The Frankfurt office was located in the city’s Westend at Friedrichstrasse 45. Held on the site of the Frankfurt Fair, auctions were initially run by Knut Günther until 1978 and then by Samuel Wennek until 1986. In the spring of 1987, Rippon Boswell Germany was taken over by Christa Lebold and Detlef Maltzahn, long-standing employees of the Frankfurt branch. Since adequate premises – large enough to hold auctions in house – could not be found in Frankfurt, the new owners relocated the company’s registered office to Wiesbaden. As chance would have it, the street name and house number remained unchanged after the move; the Art Nouveau building where the company has been based since the autumn of 1987 is again located in Friedrichstrasse 45, although now in Wiesbaden. Sales of important objects and collections have gained RIPPON BOSWELL Germany international renown since then, and we regularly achieve exceptional prices. The sale of the “Vanderbilt” Mughal carpet in the autumn of 1989 was a spectacular event: it was purchased by an Italian private collection for some 1.3 million Deutschmarks, then the world record for an oriental carpet sold at auction. In December 2007, a Mughal niche carpet from the rare Millefleurs group achieved another top price, selling for 456,000 Euros. In addition to our regular catalogue auctions held each May and November, as well as our intermediate auctions held without a printed catalogue, usually in March and September, we have organised special auctions to sell private collections. One example is the collection of Viola Dominguez from Santa Monica, USA, which sold in March 1992 and achieved excellent results. A less pleasant event was our forced sale of antique rugs seized from the property of a well-known gallery owner which we were obliged to hold by order of the Munich enforcement court. After a three-year delay, we were eventually able to conduct it in June 1999; it caused an international sensation, not least because the debtor had attempted to prevent the forced sale by every possible means until the very last moment. In October 1999 we sold 79 valuable unique pieces from the “Orient Stars” Collection compiled by the Stuttgart couple, Waltraud and E. Heinrich Kirchheim. 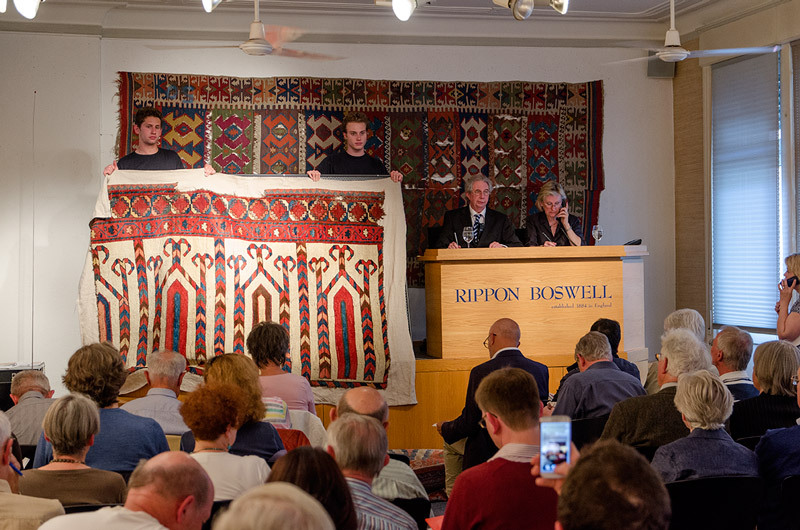 Further sales that attracted a great deal of international attention were our special auction, “The Lesley and Robert Pinner Collection of Turkmen Rugs”, in May 2004, and our special auction of South Persian nomad rugs, “The Kossow Collection”, in March 2011. The catalogues of those “single owner auctions”, out of print for a long time, have now become collectors’ objects in their own right. The fact that antique rugs and textiles often achieve outstanding results in Wiesbaden is due to the particular makeup of Rippon Boswell’s client base – leading international gallery owners and dedicated private collectors – as well as the consistently high standard of our catalogue auctions. This is what motivated architect Dr Ignazio Vok to approach us for the sale of his world-famous collection of suzanis, kilims and other flatweaves. A new catalogue format was developed especially for the occasion. The three “Vok Collection” special auctions held in April 2015, March 2016 and March 2017 were an overwhelming success, selling nearly 100 percent of the items offered. The buyers from all over the globe included several museums. In addition to our activities as an organiser of auctions, Rippon Boswell Germany also arranges private sales. We have enabled the acquisition of several important historic carpets by new owners in the past few years.